Chinese arms companies have some advantages in the regional arms trade competition, notably with their drones. China’s global arms push continues. As my colleague Franz-Stefan Gady reported last week, China is showcasing some of its military hardware to potential buyers in the Persian Gulf at the ongoing Dubai Air Show. The jewel in China’s crown at the Air Show is the FC-31 stealth fighter, basically a replica of the F-35 Joint Strike Fighter–supposedly constructed with designs stolen from Lockheed-Martin back in 2009. Another interesting piece of news from Dubai is that China and Pakistan apparently have found an unnamed buyer for their jointly developed JF-17 “Thunder” fighter. China has several other interesting items on show in Dubai. 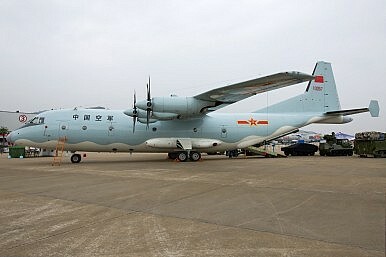 Shaanxi Aircraft Corporation has been promoting its venerable Y-8C and its modern Y-9 (basically the People’s Liberation Army Air Force’s version of a C-130 Hercules). According to Vasiliy Kachin at the Moscow Center for Analysis of Strategies and Technology, Iran has apparently ordered an undisclosed number of these aircraft. Iran has already airlifted troops to battlefields in Syria and has a requirement for more heavy transport aircraft. Perhaps Beijing’s most popular platforms on sale are its Unmanned Combat Aerial Vehicles (UCAV.) As both Franz and I have described, Chinese drones are finding buyers in many places throughout the world, including the Gulf States. The Wing Loong I and II (which are basically knockoff versions of General Atomics’ MQ-1 Predator and MQ-9 Reaper drones) as well as the Caihong CH-4B Rainbow are potentially attractive platforms for Gulf buyers. Drones are proven weapons in counterinsurgency operations, a probable use case for many of these Gulf buyers. Saudi Arabia, the UAE, and Iraq are already confirmed operators of Chinese UCAVs. For most states, part of the attractiveness in buying Chinese is the price tag. A Wing Loong I goes for as little as $1 million. A U.S. Reaper by contrast costs around $30 million. However, price is less of an issue for most of the oil-rich Gulf States. Washington places strict human rights and international law conditions on the exports of its UCAVs, and Saudi Arabia doesn’t meet the necessary standards. Indeed, it is likely that Saudi Arabia and the UAE would prefer to buy American if they could. Buying from Beijing (or Moscow) is a decision borne of necessity, not choice. China is definitely playing in the major leagues when it comes to the global arms trade. However, it still has a lot of catching-up to do if it wants to compete with the top players in the game. India continues to push the U.S. government to sell the Indian Navy advanced surveillance drones. The Consequences of Global Armed Drone ProliferationIndia Mulls Purchase of US Maritime Patrol Drones for Indian Ocean The Indian Army Wants 600 Mini DronesWhat’s Behind Thailand’s New Drone Laws?What’s Behind China’s Big New Drone Deal?